UFO SIGHTINGS DAILY: Learn Why UFOs Are Seen Near Volcanos Around The World, Aug 2016, Video, UFO Sighting News. Learn Why UFOs Are Seen Near Volcanos Around The World, Aug 2016, Video, UFO Sighting News. UFOs are often sighted and documented in the vicinity of the most dangerous volcanoes in the world? Since the early 90s were observed and recorded many many objects of different sizes and different shapes, near or over the volcanoes. The video that we show below, is a television report presented by the Mexican journalist Jaime Maussan through Tercermilenio TV and talks about the UFO sightings of mysterious lights, spherical and cigar-shaped objects observed in the vicinity of the Mexican volcanoes, such as the famous Popocatepetl. 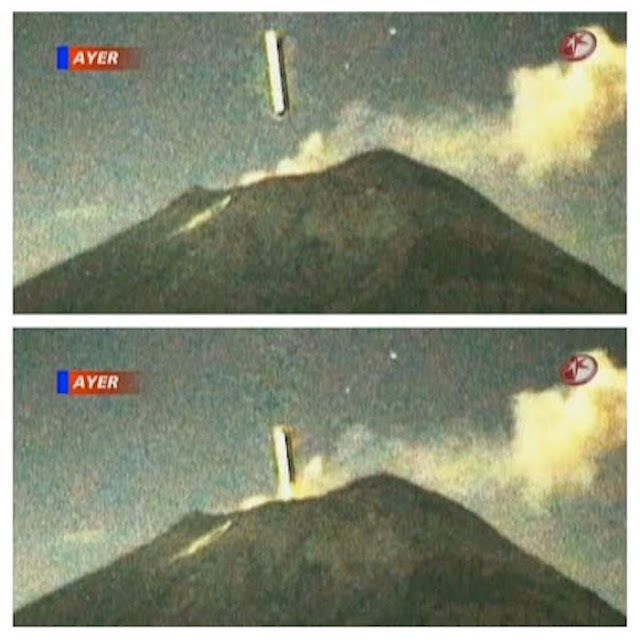 Everyone will remember the famous cigar-shaped UFO, immortalized by the CENAPRED surveillance camera, as it entered the volcanic mouth of Popocatepetl. There are many theories of UFO researchers and experts, advancing svarate assumptions, such as the one that sees a kind of monitoring of volcanic and geothermal by aliens. While other experts put forth the hypothesis that UFOs would underground extraterrestrial bases in the vicinity of volcanoes. Awesome video, and I hope it answers a lot of peoples questions about why UFOs are seen near volcanos so often.